Our hobby connects millions people based on their love of gaming. Playing a board game is a great way to spend some time, and the fact that each year we see record growth means more and more people are getting bit by the gaming bug. International Tabletop Day (ITTD) was started in 2013 by Geek and Sundry and Wil Wheaton’s TableTop series as a day to celebrate the love of gaming around the world. This year, ITTD falls on Saturday, April 29. FLGSs, board game cafes, gaming groups, and families around the world will be getting together to roll some dice, compete, cooperate, and really just indulge in this amazing hobby of ours! For today’s CMON Feature Friday, we decided to talk to a few different people about their plans for one of the most exciting days of the year (at least if you’re a board game fan). Andy Matthews is the founder of the Meeple Mountain blog. He’s been gaming all his life with his family, but his love of the hobby really took off in the last decade. Meeple Mountain runs the Nashville Game Night, which sees an average of 60 participants every month. Last year, they ran an event for ITTD that welcomed over 150 people to participate in gaming events throughout the day. This year, they’ve set their sites even higher. Matthews sees the importance of building the community to help keep the hobby strong and growing. One of the leading places for introducing people to the board gaming hobby are board game cafes. Mandy Jelsma is a Manger of and runs the social media for Snakes & Lattes in Toronto. 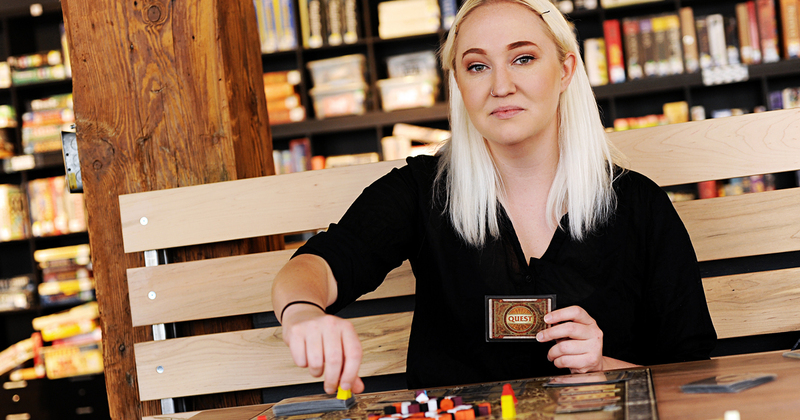 Although she’s definitely seen board gaming evolve in her four years in the industry, she still sees exposure as being the best path to introducing new people into the fold. Jelsma notes that one of the best parts of working at Snakes, is that, on any given night, she might see groups of college kids, or a table of older folks rediscovering the love of games, or parents introducing their kids to a classic. She’s also excited to see a lot more women getting into gaming. Jelsma sees the connections that board gaming provides as being the real benefit of getting into it. Snakes & Lattes will be holding a number of events throught the day on ITTD, as well as hosing their regular Saturday crowds. Kylie Prymus runs one of the oldest FLGSs in the United States, Games Unlimited. It has been serving customers in Pittsburgh since 1978. As with every year, Games Unlimited is gearing up for a big ITTD. They’ll also be raffling off free games, holding mini-tournaments, and having a big sale on almost everything in the store. Prymus sees teaching games to people new to the hobby or non-gamers as the best way to see it grow. He mentions the key is to find the right game for the people you’re playing with. Earlier this week, we asked you what your plans are for ITTD. While some of you are working, most of you are going to be gaming the day away. ITTD is a day that allows people to come together over their love of a hobby and share it with the people in their lives. Whatever you end up playing on Saturday, we hope the dice are in your favor!